Upscale your favorite DVDs to near high definition quality making the movies you love to watch on your HDTV look their best (HDMI cable needed, sold separately). Fast and slow playback with sound lets you advance through scenes quickly without missing a word. Switching back and forth between remote controls while watching television or a movie is annoying. 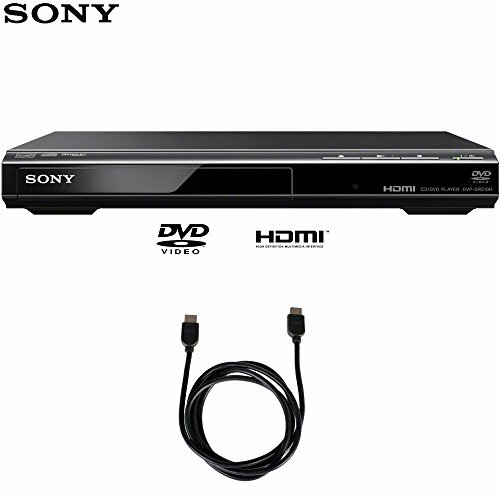 Included remote control works with most major TV brands plus the DVD player so you can stop the swap. View movies and photos and listen to music with multiple format playback. Supported formats include: DVD/DVD-RW / DVD-R/DVD+RW / DVD+R DL and CD-R/CD-RW discs, plus WMA, AAC, LPCM, MPEG1 (Cyber-shot movie), and JPEG files. Meets ENERGY STAR guidelines for energy efficiency. Upscaling DVD Player (via HDMI; cable sold separately) makes your existing DVDs look better on your HDTV by improving the picture quality to near high definition. Many home audio and video devices can use significant power, even when turned off and in standby mode. The DVP-SR510H, however, was built for energy efficiency. Child lock (tray lock) - A child lock feature help prevents children from accessing the DVD player's tray.